What an eventful 24 hours to start off this leg of the trip! We cast off around 10:30 with our regular group of volunteers and pro crew plus 35 new trainees. Their first day on board is always a busy one. There are safety drills, familiarisation rounds, rig training, learning to stand watch and a lot of "stuff you need to know" things going on as well as the regular running of the ship. Our first day was also the start of a race organised as part of the Great Lakes Challenge. Unfortunately a change of wind at 11:58 meant we weren't able to cross the start line on time (12:00-12:20) so we aren't participating. Neither are most of the ships, only 2 made it across the line in the appointed time. That's ok though, we're doing our own thing now and will still make it to Bay City on time. Because the race takes place under sail, not motor, we had lots of sails up (12? 15?) and the motor off. After four days of festival this made the maritime crew very happy! For most of the day we enjoyed nice weather, sunny, a bit of wind, etc. then during the evening things got exciting! Wind! Rain! Lightening! As the storm approached we were dousing sails asap. Even with most sails doused we roared along at over 9 knots for a bit. It took two people to hold the helm to course and we all were getting wet. Despite this the maritime crew were smiling more then ever - now this was sailing! Some of the trainees didn't look quite as thrilled with the weather but after sailing with this group for a few weeks I trust their judgement and know our safety is their foremost concern. Not to say I wasn't happy to stand down, have a warm shower (yes, we have those on board), put on dry clothes and snuggle into bed. 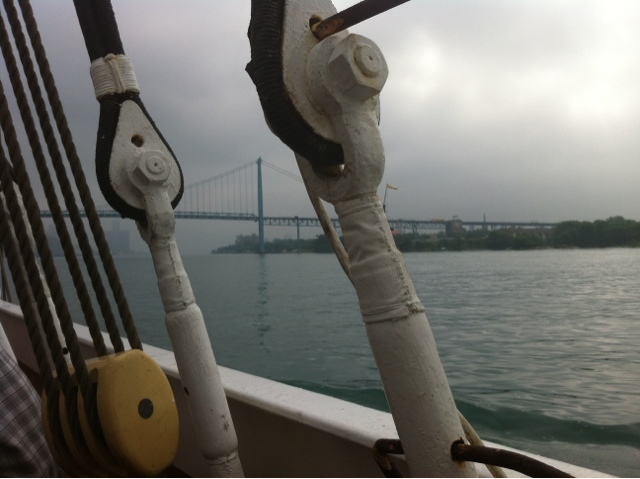 The next morning the weather had calmed down and we started motoring up the Detroit River, under the Ambassador bridge and through to Lake St Clair which is an amazing shade of aqua, almost tropical. 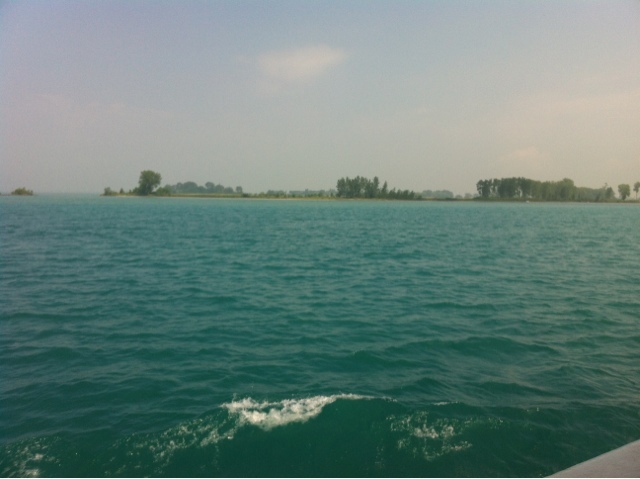 Lake Huron has been beautiful. We had sails up this morning before going under motor as we came into our anchor spot for the night. There were plans for a swim call but the water was too rough so we had lots of time to enjoy a BBQ on deck (twice in a week! ).